I've been collecting Hamiltons for about 6 years. That's not really a long time compared with other collectors I know. Although I know a lot about Hamiltons, I don't know that much about other brands. One thing I do know, however, is that new collectors always seem to follow a similar path. Once a new collector catches "the bug", they will often make rookie mistakes and buy a watch that is overpriced or something that isn't even an authentic model at all. There aren't a lot of "fake" Hamiltons out there but there are plenty of incorrect dial refinishes and recased watches that often come with pretty pictures and high price tags. If you ever see a red, blue, green, or otherwise colorful dial on a Hamilton, you may want to do a little more research before you pull the trigger. After a couple of minor mistakes, a new collector will go down one of two paths; first, they decide to only buy very nice examples or, alternatively, they decide to buy inexpensive watches that they can "fix up". Each path has it's drawbacks, but the former path is more prudent than the latter, in my opinion. There are additional phases to collecting but I thought I'd briefly opine on the difference between a very nice restored example and pursuing a fixer upper. I suppose you could say the main difference is the time and effort needed to make a project watch a restored watch. So, really, the question is what does it typically take to restore a watch? First, you need a project watch. The best project watches are the ones that come in an above-average case. If the case is worn through or otherwise damaged, it's likely better suited to donating it's parts so another watch might live. Restoring a damaged case is very expensive - assuming that it's even plausible. For example, your typical gold filled case has a gold layer that is 5% of the thickness of the metal (that's what the "1/20 10K gold filled" means). Rolled gold plated cases usually have a much thinner layer... maybe 175 microns thick. That means a sheet of paper is about 40 times the thickness of the gold layer in a rolled gold plated case. If you want to get a gold filled or RGP case replated, the applied layer will be probably 5 microns thick and typically it's closer to 2 microns. That's not a lot of gold and it will be easily worn through if you polish the watch or wear it very often. It will also cost you potentially $100 or more. So avoid cases with extensive wear or other damage, as that's an additional cost you should be able to easily avoid. There are four things you'll likely need to invest in when you purchase a project watch. 1. You need to have the movement overhauled. That means it should be completely disassembled, thoroughly cleaned and then reassembled with fresh lubricants. Watches from before 1950 will also likely need a fresh mainspring. You will find some sellers take short cuts and partially disassemble the watch and called it "serviced" or they just add fresh oil without cleaning the watch at all. I consider that the equivalent of putting on fresh deodorant instead of taking a shower. You may smell clean but you're not clean. 2. You're probably going to want to new strap. A new strap isn't always needed but, in general, a new strap is nice way to personalize a watch for the new owner. 3. 90% of the time a project watch will need a new crystal. That can be an easy do-it-yourself project but sometimes it's best to let an experienced person do it for you. A new crystal can make a dramatic improvement on a project watch. 4. Finally, the fourth thing that a project watch will often require is to get the dial (and possibly hands) refinished. This is totally optional and personal judgement call. In my experience, a nicely done (and correct) refinish is preferable to an ugly original dial. If an original dial is a distraction then you won't enjoy the watch as much. Some brands (like Rolex) are heavily penalized by a refinished dial - so never buy a project watch that requires a redial if a redial will kill the watch's value. Hamilton's do not suffer from the same snobbery... a refinished dial is fine. In fact, it used to be a typical part of the overhaul process and many people's "original" dials are actually very old refinished dials and they just don't know it. Adding that all up reveals the difference between a project watch and a nice restored example. An overhaul can run you in the neighborhood of $100 or more, depending on who you use and what the watch needs. A new crystal can be $30 or more. A fine strap is usually $20 or more. A redial can run you $70 or more... usually more with postage, etc, factored in. So that's $220 plus the acquisition cost of the project watch. If you're crazy enough to pursue original bracelets you can add another $100 or more to the tally. The moral of the story is to be careful what you buy when you first start collecting. Like most hobbies, buy what you like, not what you think other people like. Don't assume every project watch is a diamond in the rough. Sometimes buying an already-restored watch is the more prudent path to building a nice collection. In other words, I just needed to overhaul it. The model is a 1957 Cullen. It was produced through 1960. Originally it came on a strap or a bracelet. By 1960 the strap option was removed and it was a bracelet-only model. The Cullen was a mid-grade watch in Hamilton's line up. It came with a 10K gold filled bezel and a stainless back. The dial is sterling silver with a butler finish and featured solid 14K gold numerals and dots. Tucked inside the case is Hamilton's flagship movement, the 22 jewel 12/0 sized 770 grade. 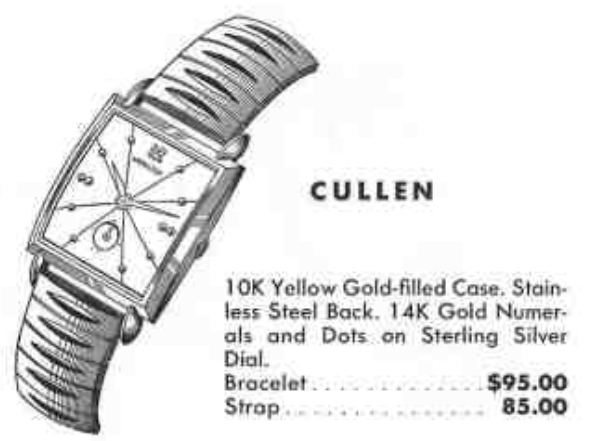 As received, the Cullen reminds me a little of another model from the 1940's called the Dyson. 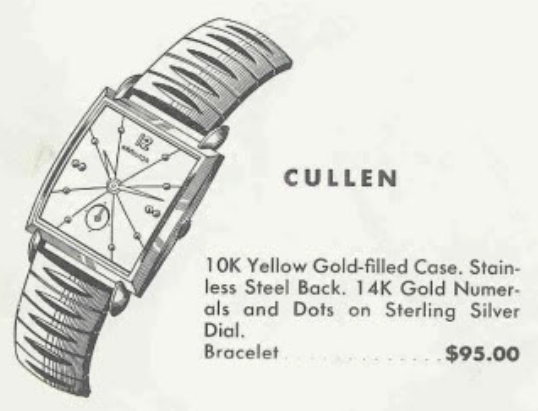 However the Cullen features lines that radiate out of the center of the dial. It's also a little larger than the Dyson. The stainless steel back is unengraved and looks almost new with a brushed finish. Stainless steel is a great choice for watch cases because it is really tough. The only distraction on this watch is the crown. It is well worn and will need to be replaced. The seller listed it as needing to be serviced and I can tell from the timer that it's running several minutes fast per day. The watch is very easy to set, too easy, as there is no resistance whatsoever when turning the crown. I wouldn't be surprised if the watch appears to run slow because the cannon pinion slips. In other words, this watch needs some help. The dial is a refinish. I can tell this from three things... first, there's a tiny notch on the edge by the 3 marker (you can't really see it in the photo). Second, the line going through the 7 marker isn't perfectly aligned with the marker - but it's close. Third, the finish on the dial looks like a recently refinished dial. The 770 is a fine movement and easy to work on. It will be interesting to see what an overhaul does for it. Everything is disassembled, cleaned and dried before being reassembled with fresh lubricants. It's the moment of truth - time to put the balance back on. Success... still running a little fast but I can tweak the regulator slightly to slow it down a smidgen. From there it's just a matter of putting the dial and hands back on but I still had to tighten the cannon pinion and fit a new crown. My finished project watch looks pretty much the same as it did when I received it. However it's now running as well as it looks and the new crown completes the restoration. As you can see, the new crown is much nicer than the previous version. Looking for the name of a late1950s Hamilton watch with a square face but a jut out on the right side. I searched through the models on this site but couldn’t find it. Any ideas.